What a week this has been for Leeds United. First of all, on Wednesday, the news we have all been waiting for, for months on end, was that GFH Capital signed the deal for the acquisition of Leeds United. As Thursday came, all our eyes were cast on the Loan Window, that closed at 5pm....Would we be getting anyone in?! Twitter was rife with rumors, Matt Kilgallon, Camerone Jerome, Clint Hill were just a few of many names being 'linked' to joining the club on a temporary basis. Finally, late in the afternoon, Alan Tate was named as the first loanee. Tate, 30, whose parent club is Swansea, is a much needed defender, a good first signing to strengthen our back line. Jerome Thomas from West Brom, was next to be linked with joining us. The rumors got stronger, and with just over an hour before the window closed, it was confirmed. Thomas was a signing I was very excited about, he has everything we've lacked of late attacking wise!! The news coming out of the club was all positive but we knew we had a massive game at the weekend, the league leaders, Crystal Palace, who hadn't lost a game in 14. I don't know what I was expecting, I knew it wouldn't be a full house at Elland Road, but as we got there at 2pm, it was still really quiet. As we got in the ground though, the smiles on everyone's faces was priceless, it was like we'd all forgotten about the Millwall game, and the fact that we hadn't won in 3. This was a new start, the new beginning we've all been wanting. The two new signings were in Warnock's starting 11, allowing us to go 4-4-2, Diouf and Becchio upfront. The opening minutes were very positive for us, we had two good chances of scoring in the opening three minutes. Thomas showed us what he was capable of on the 4th minute when he took the ball past Palace's midfield and sent a brilliant cross into the box. Some great play by Sam Byram on the 7th minute, saw him get into a great position to cross the ball into a waiting Becchio, who jumped up to head the ball, Speroni had it covered though and saved. We were playing with purpose, something we'd not seen for a very long time. It took the Eagles 11 minutes to get a shot on target, Joel Ward, trying to open the scoring but Paddy Kenny saved. David Norris was next to try and put one past the league leaders on the 13th minute, Speroni pushed the ball away however and it went out for a corner. 15 minutes into the game, Jerome Thomas was playing brilliantly and he found himself with enough space to shoot from just outside the area but it was too much and went just wide. The referee, Coote, awarded Palace with a corner on the 17th minute, which, from where I was standing, wasn't a corner at all. Owen Garvan took the corner and Becchio cleared it away. A minute later though, and Garvan was there again, Paddy Kenny saving his chance on goal. Palace were piling on the pressure on the 30th minute and Kenny had to be vigilant as Jonathan Parr had a shot on target which Paddy saved and seconds later he saved the follow up from Murray. 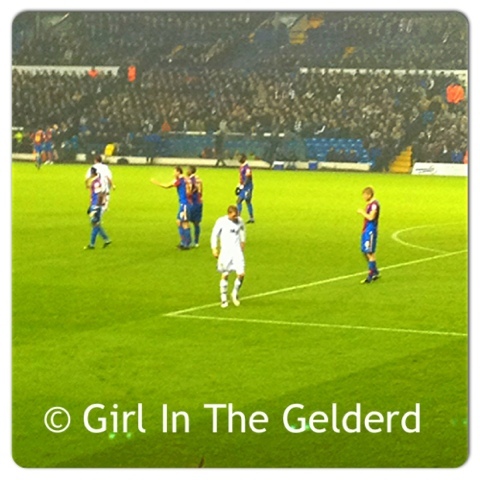 Becchio tried his luck with a long range shot on the 42nd minute but it never posed a threat to Speroni as it went wide. Half time came and both sides went in goalless but so far, it had been a massive improvement on previous games. We were still a bit weak in midfield and lacking something of a creative midfielder but it was a solid 1st half performance. I hoped we'd come out with the same pace and intensity we had in the first 20 minutes of the game but we still had to stop their counter attacks. The opener came on the 51st minute though as Luciano Becchio managed to smash the ball past Speroni from short range. This was a brilliant moment not only for us, but for him after being centre of criticism for a long time and also a great moment for the new owners who jumped up in delight. Luciano gave the Kop a cheeky little Leeds Salute before play began again, now, we had to keep the hard work up, as we knew Crystal Palace were going to push forward to try and get the equaliser. Jonathan Parr had an effort on goal for the visitors from just outside the box on the 53rd minute but it missed the target. A fantastic save from Paddy Kenny after Yannick Bolasie shot on goal on the 55th minute. 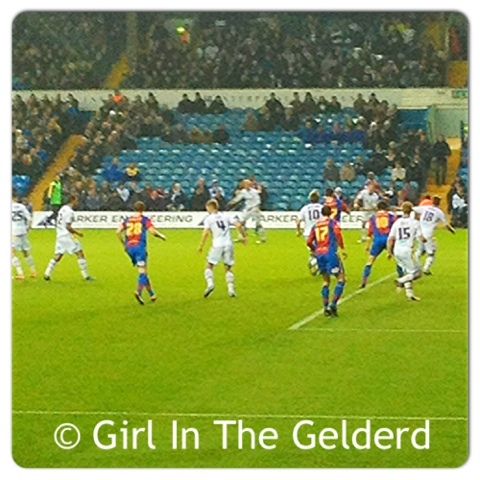 Bolasie took the corner from but any danger was cleared by Becchio. We were pushing for a second goal and Tonge was the next to get a shot away, on the 65th minute but his effort was wide. The ball fell to David Norris on the inside of the box on the 73rd minute but it was well over the crossbar. Jerome Thomas was replaced after 75 minutes by Dominic Poleon, who early on in the week had his loan spell at Bury extended, only to be called back the following day!! 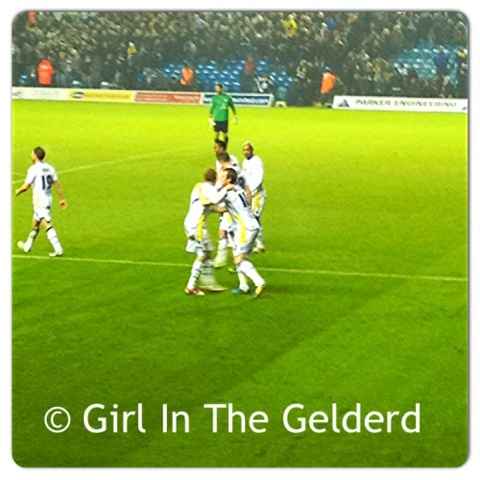 Neil Warnock decided to change the game on the 82nd minute of the game, bringing on Ross McCormack for El-Hadji Diouf. Jermaine Easter missed wide of the goal with a headed effort on the 83rd minute. Palace were pushing to try and get a goal on the board, and with 5 minutes left, they were gifted a goal. Dom Poleon lost his man, Dikgacoi in a 1 on 1 defensive battle, he then crossed a ball into the box and Ramage who was unmarked was able to head the ball past Kenny, giving the visitors hope of salvaging a point from the game. This was going to be a nervous end to the game. 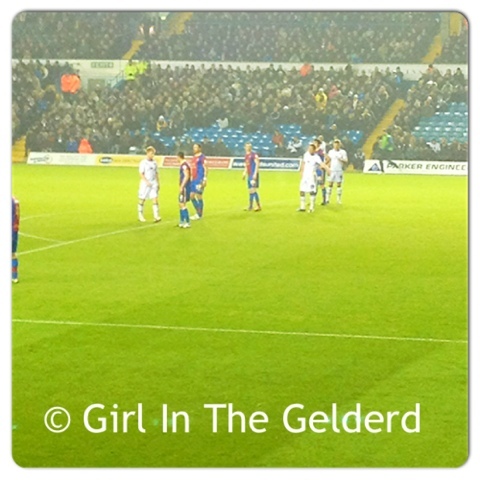 Glenn Murray was eventually shown a yellow card by Coote after a foul on Ross McCormack. 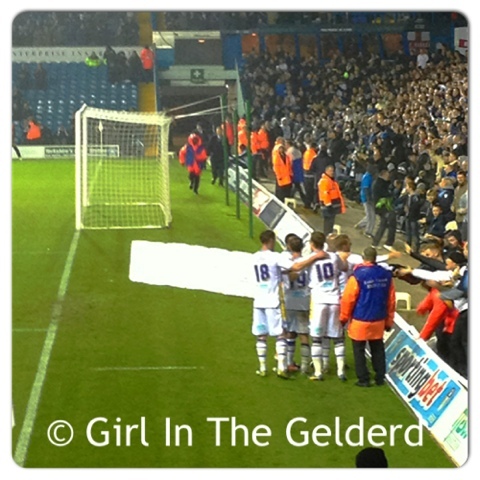 McCormack saw his long range effort go well over the bar on the 87th minute. 5 minutes of time was added to the game and we knew we had to put every ounce of energy we had left into defending this lead, but, never the ones to do it the easy way, David Norris gave away a free kick on the edge of the area. Warnock took Dom Poleon off and replaced him with Michael Brown, who had returned from suspension. 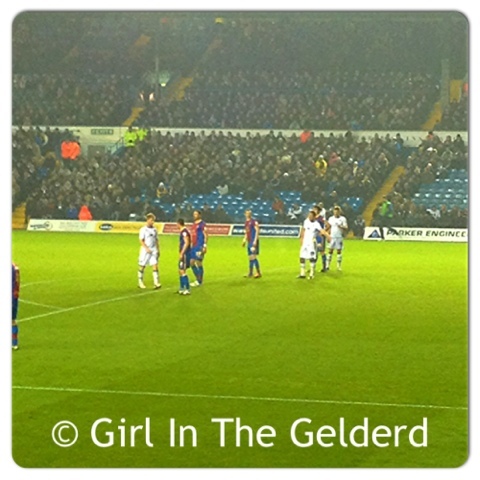 Moritz sent his free kick into the area, but Becchio cleared it away. Those 5 minutes felt like hours, but eventually,the ref blew the full time whistle and the 3 points were ours. Brilliant end to a brilliant week. It was a shame we couldn't keep a clean sheet and we did soak up a lot of pressure in the closing minutes, but, that's football. We held them out to win the game and that's what counts. 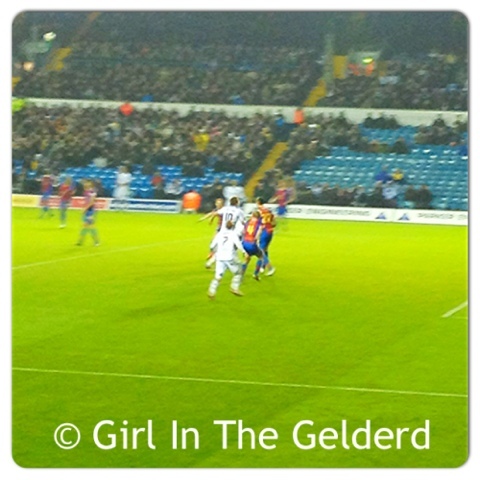 As I mentioned earlier, until yesterday, Palace were unbeaten in 14, and they were by no means rubbish. Their counters were fast and punishing. Sam Byram was excellent and kept Wilfred Zaha quiet all game. Jerome Thomas, was brilliant, exactly what we needed on the wing, ran at midfielders and defenders, passed & crossed the ball well, really impressed me, hope to see a lot more of him in the coming weeks. Luciano Becchio had a MUCH better game, not only going forward, but he cleared a lot of Palaces' crosses and corners that came into the box too. The goal looked to fill him with confidence and will hopefully see him regain his goal scoring form. Paul Green was brilliant yesterday too, probably my man of the match, he offered a lot of protection to Sam Byram on the right wing and took his goal really well.